As stated elsewhere on this blog, I’m a big fan of David Vining’s Long Tone Duets. They are great for working on ensemble, intonation, and lots of other issues. The final duet (No. 23) is based on the horn solo from the second movement of Tchaikovsky’s Fifth Symphony. In his preface to the horn edition of Long Tone Duets, John Ericson writes that this solo “is absolutely an excerpt that needs not only perfect intonation but awareness of the underlying harmonies and music. This duet will see much use in my teaching.” [p. i] After using this duet and others in lessons for the last several months, it finally dawned on me that a fun project might be to create other duets based on well known horn excerpts. 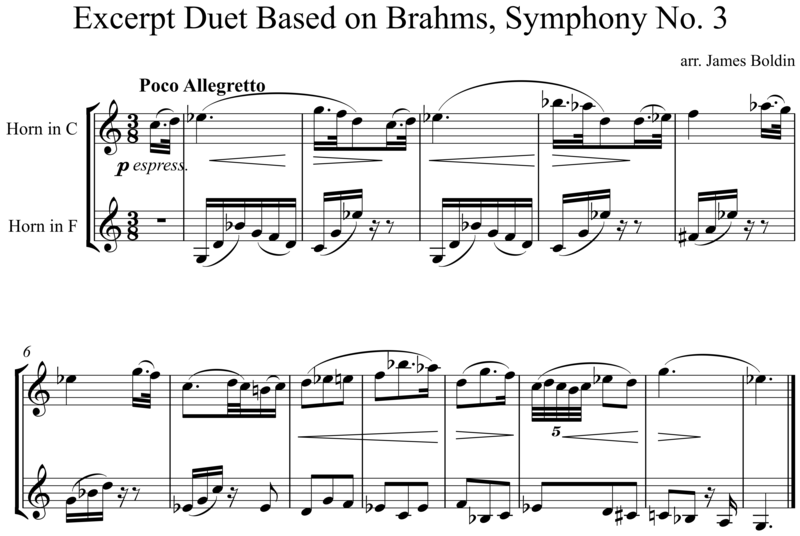 Precise rhythm, accurate intonation, and a knowledge of the other parts is crucial when preparing any excerpt, so hopefully this duet based on the horn solo from the third movement of the Symphony No. 3 by Brahms will be useful. With the exception of the added note in the final measure, the solo part is exactly the same as the original excerpt, including the transposition (Horn in C). The second part is based on the cello and viola parts, with a few adjustments here and there to make things more playable. The part is notated for Horn in F, and can be easily sight read by the teacher. The duet is designed to help the student not only hear the underlying harmony, but also the relevant subdivisions in each measure. Feel free to print the image above or download the PDF below, and if you want to edit anything to make it more useful in your teaching by all means do that as well. Let me know if you spot any errors! I hope to do a few more of these in the future, but as this is somewhat of a side project I’m not exactly sure when they’ll be ready. Another excerpt that might work well in duo form is the “Nocturne” from Mendelssohn’s music to A Midsummer Night’s Dream. Are there some other excerpts you would like to see turned into duets for instructional purposes? Leave me a comment and let me know what you think. Cool, James! Thanks for sharing! This is really an excellent idea. Thanks for the free print! Thanks Nick! Will try to post another one next week.